Nebraska gets its name from an Indian word meaning "flat water" after the Platte River that flows through the state. It became the 37th state in 1867. Nebraska, once considered part of the American desert, is now a leading farming state. Nebraskans have practiced scientific farming to turn the Nebraska desert into a land of ranches and farms. Much of the history of the state is the story of the tough, strong-willed Nebraska farmer. 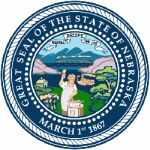 In the 1860s, the first great wave of homesteaders poured into Nebraska to claim free land granted by the federal government. Many of the first farm settlers built their homes out of sod because they found so few trees on the grassy land. Tourists can now drive along highways that follow the historic Oregon and Mormon trails. Almost every county has a fair during the summer and many communities hold annual fall festivals. "Nebraska" leitet sich von dem indianischen Wort für "flaches Wasser" ab, eine Bezeichnung für den Fluss Platte, der durch den Staat fließt. 1867 wurde Nebraska der 37. Bundesstaat. Nebraska, einst ein Teil der amerikanischen Wüste, ist nun ein führender Agrarstaat. Die Bevölkerung Nebraskas nutzte die Erkenntnisse der Agrarwissenschaft, um die Wüste in fruchtbares Land für die Vieh- und Landwirtschaft zu verwandeln. Die Geschichte des Bundesstaates ist weitgehend die Geschichte seiner zähen, willensstarken Farmer. In den 1860er Jahren strömte die erste Welle von Siedlern nach Nebraska, um das freie, von der Bundesregierung bereit gestellte Land als Eigentum zu beanspruchen. Viele dieser Siedler bauten ihre Häuser aus Rasenstücken, weil sie so wenige Bäume auf dem Grasland fanden. Heute können Touristen den Spuren des historischen Oregon Trail und Mormon Trail auf ausgebauten Straßen folgen. Fast jedes County (Landkreis) hat sein eigenes Sommerfest und auch im Herbst finden in vielen Gemeinden Festivals statt. Agriculture: Cattle, corn, hogs, soybeans, wheat, sorghum. Industry: Food processing, machinery, electric equipment, printing and publishing. Texts are abridged from U.S. State Department IIP publications and other U.S. government materials. What kind of information materials are available? CD: These documents are available in fulltext format on the About the USA CD-ROM. Teachers: Request a copy for classroom use. L: Selected documents are available in German as well as other languages, including Arabic, Chinese, French, Spanish, Persian and Turkish. Any reference obtained from this server to a specific commercial product, process, or service does not constitute or imply an endorsement by the United States Government of the product, process, or service, or its producer or provider. The views and opinions expressed in any referenced document do not necessarily state or reflect those of the United States Government.